In this pancake house, waffles also are superb, here topped with butter and blueberries. A close-up of the blueberries atop the waffle show their diminutive size, just right for a single one to fit into one of the diminutive squares of this crisp, small-tread waffle. The frothy stuff other than blueberry juice is melting butter. I buttered the waffle and loaded on the berries and took this picture FAST so I could get to eating one of the finest waffles there is! Here is how the blueberry waffle arrives at the table, whipped butter ready to spread (oh, so easily), and fruit compote ready to decant. Devotees of corned beef hash need to know about this gentle-tempered version, sided by a sheaf of thin potato pancakes and topped with two sunnyside-up eggs. Sour cream and apple sauce come on the side. While it is (rightfully) known as a pancake house, this is an all-too-rare opportunity to have an excellent, old-fashioned, small-tread waffle of the pre-Belgian style. Here it has just been schmeared with butter and drizzled with syrup, and is framed by OPH's excellent bacon. The butter, being soft, spreads instantly. The berries need a little help out of their pitcher. They are packed in tightly, but firm enough so that virtually none break or get mushy. Their firm texture is as much a fine complement to the crunchy waffle as is their vivid fruit taste. Already sprinkled with a bit of powdered sugar, this just-served Dutch Baby wants more (provided on the side) as well as several spritzes of fresh lemon juice. The combination makes aristocratic syrup that perfectly complements the eggy baked pancake. We have never had a more delicious glass of orange juice than this one: freshly squeezed, pulpy, and brilliant-flavored. The first of many fine Original Pancakes Houses opened in 1953 and set high standards maintained by its progeny today. This used to be a favorite place of Oregon native James Beard. Driving south on I-5 out of Portland, The Original Pancake House is easy to find. It is right at the end of exit ramp 296A. What waffle lovers eat in heaven. The Original Pancake House is a nationwide franchise; and miraculously, every one of the several dozen branches that we’ve sampled maintains the highest standards of quality ingredients and delicious food. Still, some are better than others. At the head of the list is the original Original Pancake House of Portland. Since 1953, this place has defined pancake excellence. Original Pancake House pancakes are to ordinary restaurant flapjacks what champagne is to grape juice – so good they are almost like another kind of food altogether. They are elegant, complex, transcendent … and yet utterly satisfying the way only pancakes can be. The secret, other than good recipes for a large variety of ‘cakes from simple buttermilk silver dollars to elaborate crepes, is that the kitchen uses the highest quality ingredients; and this is no mere marketing-ploy boast. You really can taste the freshness of butter and eggs in everything served; even cream that comes with coffee seems like something from a farm kitchen; and orange juice is the pulpiest, most flavorful we’ve had anywhere. Omelets – made with a half-dozen eggs – are beyond compare. The corned beef hash is superb. Bacon is thick and chewy, with just the right amount of crunch to every bite. The top-of-the-line pancake is baked apple, a vast plateau of deliciousness big enough for two mighty appetites. 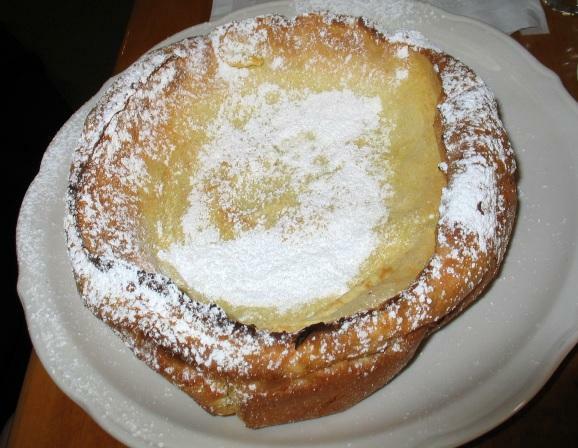 The other baked pancake, a Dutch Baby, lacks the gooeyness of the baked apple, but has the same deliriously eggy richness; and when you spritz it with lemon juice and sprinkle on powdered sugar, you create an elegant syrup that makes it an impossible-to-stop-eating sensation. A word of warning: the Pancake House gets crowded on weekends and takes no reservations; come at an off hour if you can. And it is closed both Monday and Tuesday.